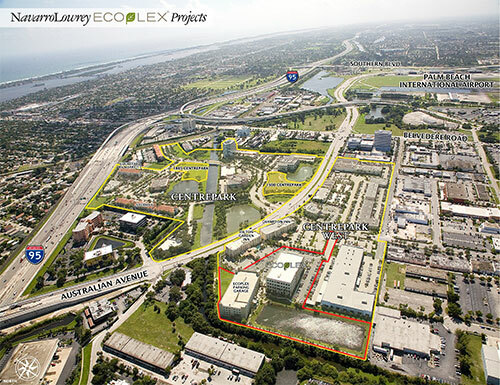 One of Navarro Lowrey's most ambitious projects to date is the development and continued management of West Palm Beach's acclaimed Centrepark Office District, a 69-acre mixed-use corporate park approved for over one million square feet of office, retail, hotel and flex space development. Since 1994, Navarro Lowrey, Inc. has developed over 500,000 square feet of Class "A" office and flex space in the 41-acre Centrepark and 28-acre Centrepark West, which are home base to more than 3,000 employees and over 100 companies, including TD Bank, Progressive Insurance, and Florida Public Utilities. The Office District is also home to a Courtyard by Marriott, a Hampton Inn, and a Hilton Garden Inn, which together offer over 300 rooms. The Centrepark Office District is strategically located only minutes from downtown West Palm Beach, CityPlace, the Palm Beach County Convention Center and Palm Beach International Airport. It is also situated near I-95, Australian Avenue, and the Florida Turnpike.